Moving is a situation that generates a lot of stress, not only for those in charge of sorting, packing and storing everything, but also for our pets. Cats, as very territorial animals, are particularly sensitive to the changes in their environment, so any change in the place where they live translates into nervousness and fear. Dogs, especially older animals or those with impaired hearing or sight, experience great anxiety in these situations. Pets usually hide, are more irritable, stop eating or eat little, change their behavior, become ill, and some develop a “flight instinct” when they feel that their home has been invaded or when arriving at a new place, simply because they don’t recognize it as their own. 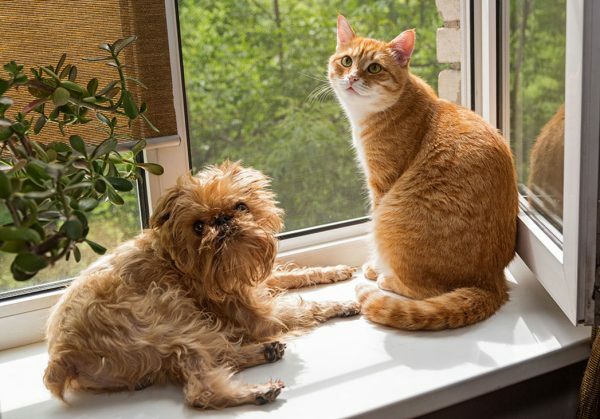 However, there are a few tactics to lessen the negative effects of moving our pets. For cats, it is important to allocate a space in the house (both in the old and the new one) where they can take shelter while we store things, enter and leave, and where they have everything a cat might need. Having a safe bunker (sometimes a simple cardboard box – they love it!) with their water, food, scratching post and litter box nearby will help them feel safe in the midst of chaos. Initially, we must secure windows and balconies to prevent them from jumping. Over the next few days, it is important to stimulate their appetite with what we know they like best, make sure they are wetting their litter, and pay attention to any behavioral change. Furthermore, letting them explore the different environments of the house and awakening – through play – the “hunter” inside every feline will help convince them that they are lords and masters of the new territory. As for dogs, they usually seek a way to escape as a result of anxiety. It is therefore advisable to visit the new house together some days before the move, to familiarize them with the new surroundings so it doesn’t feel so foreign to them upon arrival. During the move, respect the place they “chose” to lie down if scared, and if you see that they are restless, take extra precautions to keep them from fleeing. Once installed, it is crucial to respect routines related to meals, walks and play. Over time, try to spend as much time with your dog as possible, because this, along with the activities that allow for relieving anxiety (taking walks, retrieving a ball, etc.) will help them feel that their “pack” or their human family is finally safe.